New boat! Baby not included!!! Call or text Joe at 770-519-7677. Several other models in stock as well. We ship for $99. The V10 Sport offers terrific flat water speed and exceptional rough water performance, similar to the V10, but with more stability. It is the best all-around surf ski for intermediate to advanced paddlers in a variety of conditions! Intermediate level paddlers will quickly appreciate the higher speeds on flat water, while advanced paddlers will enjoy the enhanced balance, speed and handling characteristics in larger conditions. 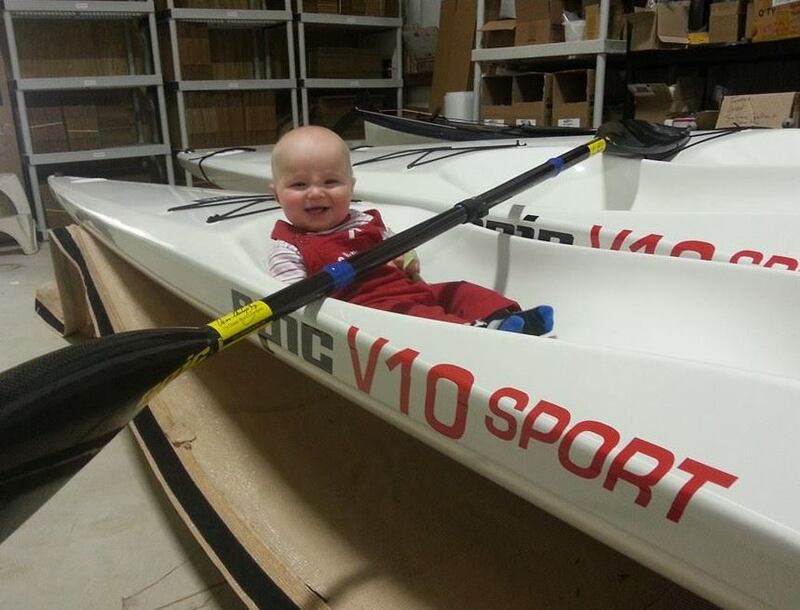 The V10 Sport fits a wide variety of sizes, accommodating paddlers from 5’0” to 6’7”. The footbrace is fully adjustable with self-adjusting pedals. The V10 Sport now comes with Epic’s revolutionary bailer system. The bailer can be completely closed for flat or cold water conditions and has four adjustable positions depending on the conditions. It can be easily operated with your foot so you never miss a stroke!